Add-on units for file racks One-sided. The META boltless shelving combines simple assembly with the durability of solid steel plate construction and utmost stability in daily use. 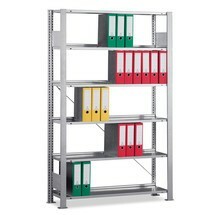 The light grey filing shelf base unit can be easily expanded with add-on units. Companies have to deal with an ever increasing number of archived documents and important papers. The galvanised bolted shelving from META represents the perfect solution as it can be expanded at any time. Bring order to your ever growing archive with this functional add-on unit for META file shelves. The galvanised file shelves offer single-sided access and are simply attached thanks to the tried-and-tested, functional shelving system. Bring order to your ever growing archive with this functional add-on unit for META file shelves. The painted file shelves offer single-sided access and are simply attached thanks to the reliable and functional shelving system. 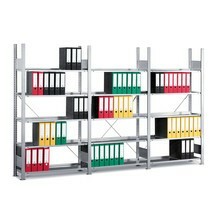 The add-on unit for your META filing shelves is tried-and-tested in thousands of different businesses. The rack is assembled in a flash and the height of the shelves is set via a functional hole pattern. Are you looking for a space-saving, easily accessible storage solution for your files? 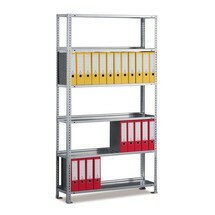 Then you require a shelving system that is as functional as it is flexible. This add-on unit allows you to expand your META filing shelves in a flash. 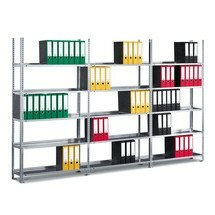 The add-on unit for your META filing shelves is tried-and-tested in thousands of offices across Europe. The rack is assembled in a flash and the height of the shelves is set via a functional hole pattern.